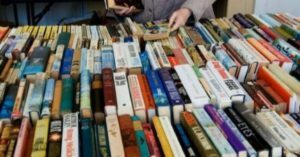 PALMDALE – The Friends of the Palmdale City Library will hold a Fantastic Finds Book Sale on Saturday, Feb. 23, from 10 a.m. to 4 p.m. at the Library, located at 700 E. Palmdale Blvd. All proceeds go to support Palmdale City Library events and program. Friends of the Palmdale City Library is a non-profit organization staffed by community volunteers and dedicated to raising money for the support of the Palmdale City Library. The Friends are always looking for new members and volunteers. For more information, visit www.friendsofpalmdalelibrary.org.